I realize that last week, I didn’t do my weekly update until like, Thursday. I was sick. I am still sick now, but at least I am moving again! I only have one quail that is laying right now (the others may not be old enough yet). I also have two quail that were crowing, so are roosters. They are getting a lot of spent brewing grain, which is very high in protein. Yesterday, I also grabbed a bunch of free pallets (love Craigslist), and am going to be building them a bookshelf-like housing unit, that slopes down so I can collect eggs without disturbing their peace. 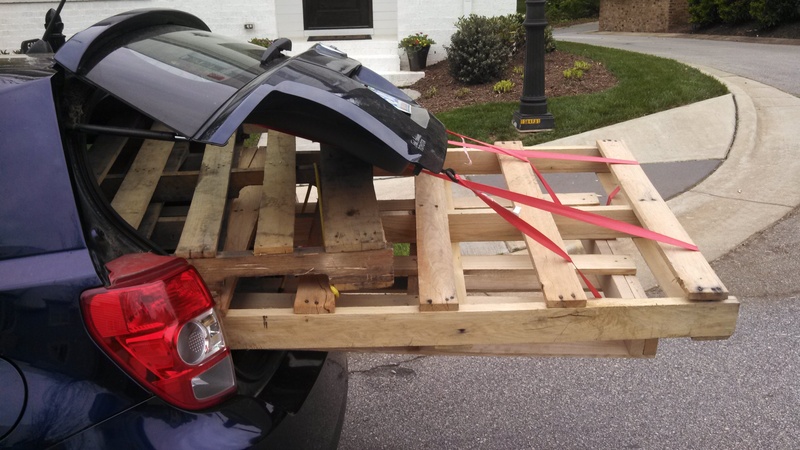 You would be amazed at what fits into the back of a hatchback. The monster chickens continues to grow LIKE CRAZY! Even though I don’t always leave them food. I had them out in the yard a bit yesterday, but they are only three weeks old, and don’t have full feathers yet. The Cornish cross is 2.58 lbs, which, again, is nearly double the 1.34 lbs he weighed last week. Same with the Cobb crosses, they average out at 1.28 lbs, again more than doubling in size from 0.57 lbs last week. They all still can stand up, and have plenty of room to roam around. 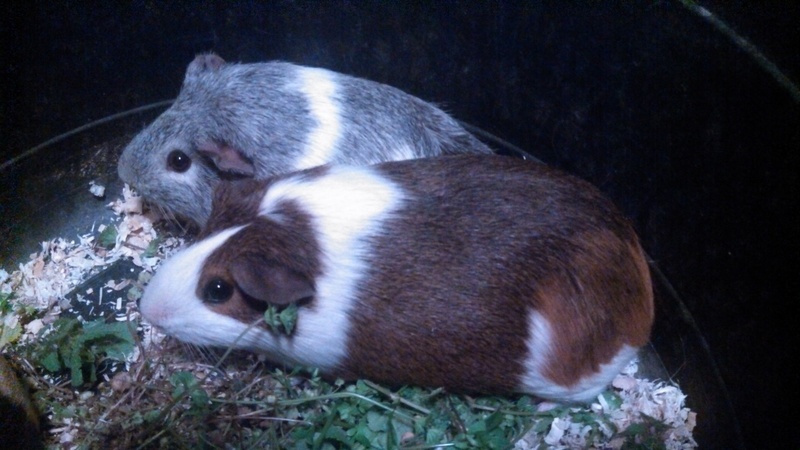 Two of my Guineas, hanging out when I am cleaning their cage. After losing a substantial amount of weight after the first week, Steve-O (my breeding male) is back up to 2.32 lbs. The average weight gain this week was 0.07 lbs. With the most coming from Cookie and Chocolate (Both in the picture) at 0.11 lbs. Charcoal, the free girl I got from Petsmart, is down to 1.66 lbs. This is the second straight week that she has lost weight. It could be her increased activity? I see her eat and drink. If it continues again, I will pull her out into quarantine. I also cut the nails and groomed of the six currently in the breeding pen (Steve-O, Butters, Charcoal, Cookie, Chocolate, and Creme Puff) while their temporary pen was drying. That was an experience that was super interesting… But, I made up for it by delivering some fresh greens to them. That is all for now! Have a TON of work to do in the next week (like finishing the free range Guinea Pig cage… quail pen, earth day adventures, an earth day workshop, foundation application for my agronomy grant, seed ordering, dismantling pallets, writing a paper, etc. ).